Klein Tools offers an innovative variety of durable attachments providing the right tool for any wire and cable fishing situation. This seven-piece attachment set plus hard carrying case includes the unique Double-S hook and a redesigned Whisk. The Double-S Hook is designed to grab wire or cable and secure it with the attachment when pulling. 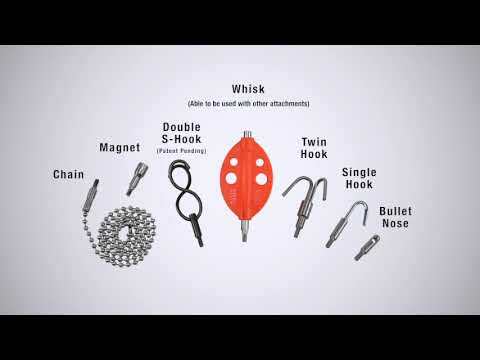 The Whisk has an updated, sleek design for manuevering over and around obstacles, and a female connector to attach hooks or bullets for a complete solution. Note: Does not fit Super Rod Series (SRS) fish rods.